Peanut butter cookies are one of the easiest cookies to make and source ingredients that are often right in your pantry. I decided to try this recipe from the Butter book I got over Christmas. They turned out to be extremely soft yet crunchy on the first bite – which is sometimes hard to accomplish with peanut butter cookies (as they often turn out like hard hockey pucks). 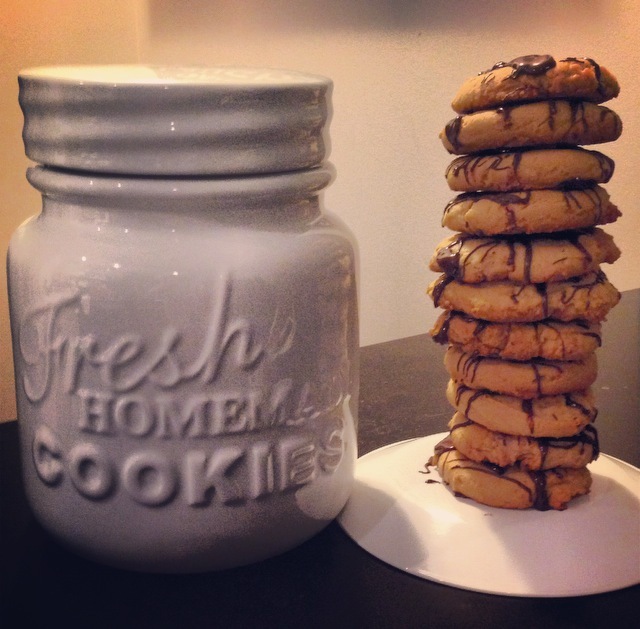 These cookies are sure to be a hit – who doesn’t like peanut butter? Especially when it has chocolate drizzle incorporated with it. COMBINE: flour, baking soda, and salt. set aside. CREAM: the butter and peanut butter on medium to high speed until well blended. Add the granulated and dark brown suagrs and continue to cream until light and fluffy. Add the egg and beat briefly. Scrape down the sides of the bowl. Add the vanilla and beat again to combine. Scrape down the sides of the bowl again. COMBINE: turn the mixer to low and add the dry ingredients and mix until fully combined. Drop 24 equally sized portions of dough onto prepared cookie sheet. DRIZZLE: find a pot and boil some water, place some semi-sweet chocolate chips in a bowl and place the bowl on top of the pot. Stir chocolate chips until they’re melted and in liquid form. When your cookies have cooled, drizzle the liquid chocolate on top of your peanut butter cookies. Posted in Baking, CookiesTagged baking, chocoate drizzle, cookies, peanut butter, recipesBookmark the permalink.